The lens uses an optical construction of 21 elements in 14 groups (including five ED lenses and one super ED lens) to help reduce chromatic aberration and deliver ultra-sharp images across its focal range. The 5.0-stop image stabilisation system and linear motor work in synergy to achieve quiet, accurate and fast auto focusing. The lens is perfect for shooting a variety of subjects handheld, including portraiture, wildlife, weddings, sport and fast-moving subjects. -The optical construction of 21 elements in 14 groups, which includes five ED lenses and a Super ED lens, delivers results comparable to a fluorite lens, and by reducing axial chromatic aberration it produces images full of detail. 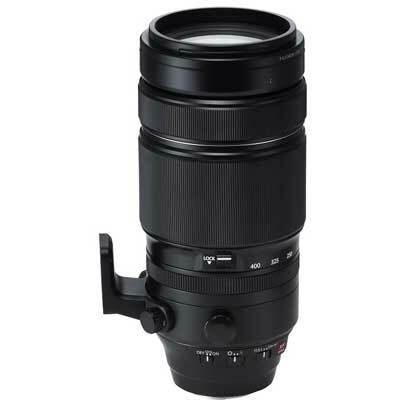 - The maximum magnification is 0.19x, enabling users to shoot telephoto macro images. - A 5.0-stop image stabilisation system – the most powerful in any super telephoto zoom lens – produces blur-free results even at the maximum telephoto setting of 609mm (35mm equivalent). Also, if panning is detected, the lens automatically switches camera shake correction to the vertical plane only. - Twin linear motors are used to deliver fast focusing on moving subjects. The motors are so quiet that the lens is ideal for shooting live music performances and theatre productions. - Even faster AF shooting is possible with the focus limiter function, which limits the close focusing point to 5m. - The FUJINON XF100-400mmF4.5-5.6 R LM OIS WR has a weight of less than 1.4kg which reduces the strain of shooting handheld substantially. When mounted to the FUJIFILM X-T1 body, the combined weight is below 2kg. It enhances user mobility. In addition, the weight distribution of the lens when attached to a body makes it feel lighter than it really is. - The lens features 13 water and dust resistant seals at 12 points, allowing you to shoot with confidence in tough outdoor environments. - The fluorine coating applied to the front lens element is water repellent and it is less susceptible to smudges and can easily be cleaned. - The lens hood features a sliding window so a polarising filter can still be accessed even when the hood is in place. - The hood also features a locking mechanism to keep it securely attached to the lens. 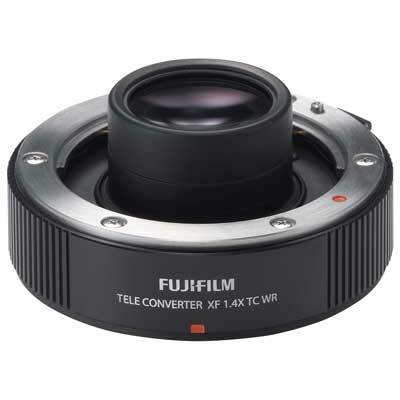 -The lens offers compatibility with the XF1.4X TC WR tele converter. When attached, it becomes a 140-560mm F6.3-8 or 213-853mm (35mm equivalent). Phase detection AF shooting remains possible, even at F8. - A lens plate (MLP-75XF) compatible with ARCA SWISS tripods is available as an optional extra. This plate is also compatible with the XF50-140mm F2.8 R LM OIS WR.